According to a recent article out of the UK, low-tech living is making a comeback. Books, records, typewriters, flip-phones and Polaroids are technologies that just won’t go away. I consider myself lucky to be in my early fifties at this time. I had the benefit of living in the era when these technologies were used every day. Books will always exist in my world because I do not find comfort in reading on a screen. I have both a manual and electric typewriter. The electric I still use to occasionally address envelopes (yes, I pay bills with handwritten checks and correspond through the US mail). I’m writing the first draft of a long-term project on the electric typewriter because it both slows me down and puts me in the frame of mind of writing in a different era. I have a landline telephone and my cell phone is a flip phone. But I won’t go to the Polaroid. Or back to the 35mm SLR camera. I do love my Sony digital camera. It saves a lot of money on film and developing. Recently, I returned to vinyl. In the summer of 2014, my Aunt Marlene and Uncle Bob moved to Portland, Oregon. They had my Aunt Amanda’s (Aunt Menda, we called her) Victrola in their basement. Having moved from an apartment to a house just weeks before, they offered it to me before donating it. Then, I purchased a Crosley turntable from my friends at Weirdsville Records/Paperback Writer Books. I’ve unpacked the stash of my few remaining records from the days of 33 1/3 rpm musical entertainment, as well as the newest editions of vintage vinyl to my collection, and have them all stacked on my desk in the basement. Occasionally before or after dinner, I’ve descended into yesteryear to unwind from the day of writing or court (or both), to spin one of the records. The basement transforms into a dance hall of memories, swaying me into another era. My intent here is not to review these records. Music isn’t my forte. Sure, I was in the band during my middle and high school years, but it was under duress. For me, music is the trigger of memory and fun. I’ve been partial to soundracks over the years, because they invoke the memory of the scene of the movie. And thumbing through the albums, fun is at the forefront. The Monkees. ShaNaNa. Blues Brothers. Madness. Doug and the Slugs. Some artists that the population love, I just can’t listen to. And some artists that the population ignore are those I prefer. Can’t explain it. Maybe during these vinyl memories I (or you) will. Enlighten me if you do. The Design Records album above is The Super Record of Super Heroes Played by the Super Dupers. I’ve had this album since I was a kid, and listening to it brought back the groovy time of suburban adolescence in the 1970’s. The 70’s. I was eight years old entering it and graduated high school June of 1980. It was a time of riding my bike up to Wiltse’s Pharmacy on Main Street in Plymouth, or all the way out to the Beyer/Rexall Drug Store on Ann Arbor Road and the Little Professor Book Store in the strip mall at Sheldon and Ann Arbor Road, to see the new comic books that were for sale. It was a time of weekly car rides out to C.C’s – Classic Comics and Movies – in Farmington Hills, to descend into the cellar of four-color fantasy. Also, baseball and hockey cards were collected, and the discovery of dishonesty from some friends who, when trading cards with them, stole from me. It was the era of the Mego action figures and the friendship of a kid who visited his grandmother across the street, who was the only other person I knew that shared these interests. A time of innocence. Dreams of being a hero despite the unathletic, scrawny frame. This is the perfect album to begin with. The tunes on this album were not the television theme songs, but arrangements based on the characters. Funky and fun, replaying it brings a smile. The March of Tarzan, with the exception of the classic Tarzan yell, is instrumental with guitar and organ. 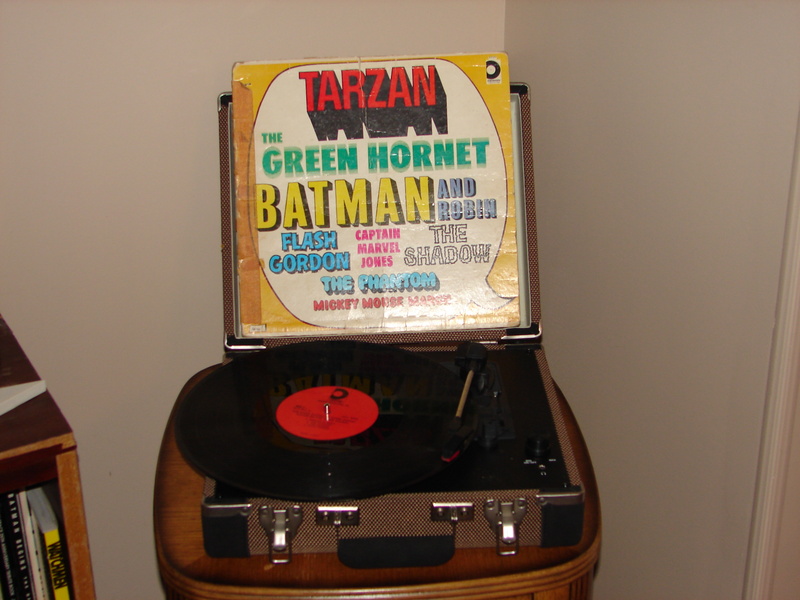 The Green Hornet is an odd variation in piano and 70’s techno instead of the powerful trilling trumpet. Yeah, I’ll be enjoying this one again and again. I found YouTube clips of some of the tunes. Here’s one of them. I have the Super Dupers album, too, and was trying to find out more about it. Turns out that Gregg and Duane Allman and Leon Russell played it on! I’ve had this record for 50 years and just found that out. Thanks for sharing that info. That’s cool!